The last environmental fight Berta waged was against the Honduran energy company Desarrollos Energéticos, known as DESA. DESA wanted to build the Agua Zarca Dam on the Gualcarque River that Berta and her supporters felt would contaminate the water supply of the Lenca people. At the time of Berta’s death, a short documentary was being made of her environmental mission and the daily threats and intimidations that had become a way of life for her and her family. The documentary’s director, Katia Lara, met with Berta the day before her murder to discuss drone shots of the Gualcarque River. 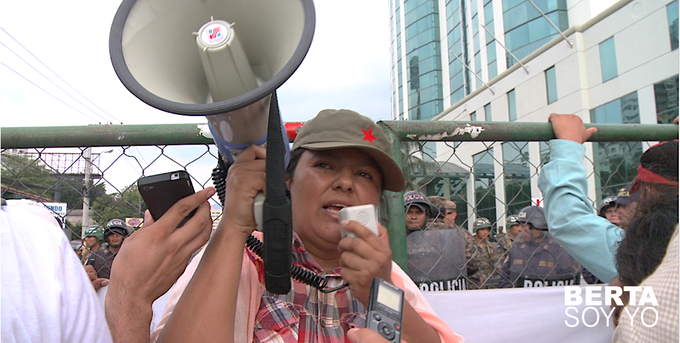 Berta gave Katia a notebook with notes on whom she thought was sending her threats over her protests against the dam. The next day she was dead, and one more Latin American indigenous environmentalist voice was silenced. The documentary Berta knew about at the time of her death was hurriedly completed to pay homage to the fearless defender. To help with the film’s funding, Katia created a Kickstarter campaign. Her goal is $10,000. As of this writing, she is halfway there. As Katia nears her campaign deadline (Nov. 23, 2017), a report by a team of international lawyers, hired by Berta’s daughter, was released on October 31, 2017. The lawyers discovered that the plan to murder Berta had been planned for months and the ones who authorized her assassination worked at the highest levels of DESA. Berta’s family hopes that the report will apply global pressure to the Honduran government to deliver justice for Berta’s murder. In the meantime, Katia continues with her film so that there doesn’t have to be another death like Berta’s. “This film will show the struggle of Berta and the Civic Council of Popular and Indigenous Organizations of Honduras (COPINH) and will shed light on the case in order to help prevent more deaths of human rights defenders of the environment and to prevent the destruction of nature and the cultural heritage of Indigenous Peoples,” said Katia.